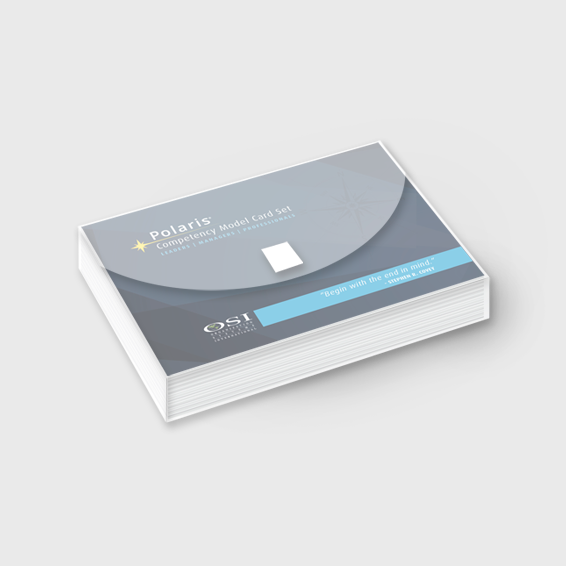 Polaris® version 4.0 card deck with custom translucent plastic expandable envelope. Contains 41 essential competencies within 7 clusters. Includes specific instructions on how to use the Polaris® competency cards to define roles and perform needs analyses. Used as the criteria for defining the ideal state needed in selection, performance management, and training. Each card contains a rich description of the competency with tips for application and suggested behavioral episode interview questions. Cards can be applied across all leadership, management, and professional roles.